A news day at Ontario's Electricity System Operator (IESO) and its nominal sector regulator, the Ontario Energy Board (OEB). In keeping with this practice, the OEB has considered it appropriate in this price setting to take into account a portion of the estimated impact of the government’s proposed Fair Hydro Plan. 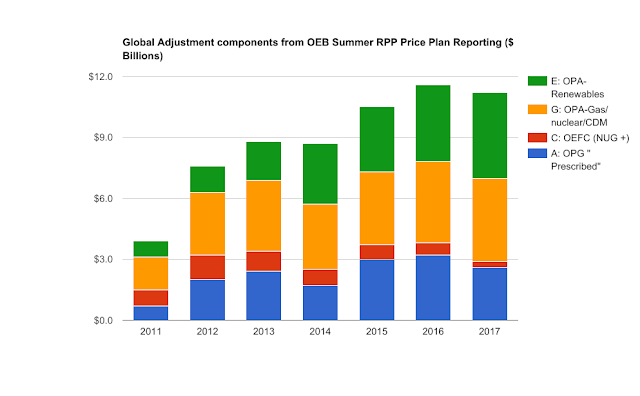 The OEB has done this by way of a reduction in the forecast amount of the Global Adjustment of approximately $1B, which represents 50% of RPP consumers’ estimated portion of the proposed refinancing of the Global Adjustment. The forecast average price prior to the OEB considering new government interference is $114.90 per megawatt-hour (MWh), or 11.49 cents per kilowatt-hour (kWh), which is up about 3% from a year earlier (roughly the inflation rate). For sketchy reasons the OEB has reduced that average rate to $97.62/MWh (15%), reflecting their anticipation of what could comprise the government's boot the cost down the road (BCDR) plan - also known by the government's spin as the Fair Hydro Plan. The 1.7 cent/kWh reduction the OEB is making is half the cut in bill mock-ups by big new local distribution company Alectra from the very day the government announced the BCDR policy. It was as if they knew what was coming. Coincidentally the IESO today announced Peter Gregg as its new President and Chief Executive Officer, noting "recently he was President of Alectra Energy Solutions." 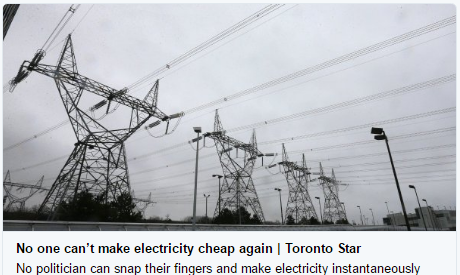 This translates to a reduction of about 15% on the electricity line, and about 17% on the electricity bill (including the impact of the 8% rebate provided for under the Ontario Rebate for Electricity Consumers Act, 2016 and the OEB’s decision to remove the Ontario Electricity Support Program charge) for a typical residential customer relative to what prices would otherwise have been, once RPP prices come into effect on May 1, 2017. This is summarized in Table ES-2. The government has indicated that it intends to introduce legislation that would, if passed, implement the proposed Fair Hydro Plan starting this summer. The OEB will then further adjust RPP prices as needed so that RPP customers receive the full rate relief as legislated. I highlighted the source here because I've been implying that the OEB was making the arbitrary choices in this pricing, when in fact a consultant may be making the arbitrary choices the OEB feels fall within its mandate (if not its ability). This is absolutely bizarre behaviour from what was intended to be an independent regulatory body. Consistent with past practice, the OEB has assessed whether it is prudent to take into account some effect of the application in this RPP forecast. This approach is in keeping with one of the objectives of the RPP, which is to smooth changes in prices over time. The OEB has concluded that, given that the review of this application remains in the early stages, no provisions for OPG’s application have been included in this forecast. Current payment amounts are assumed to persist in real terms through to the end of the forecast period. I noted at the time this was inept - dropping the nuclear rate from about 7 cents/kWh to around 6, pending the OEB ruling on a rate application that was to push it back up to around 6.5, and doing so in the name of rate smoothing. The difference is not insignificant. Once the OEB rules on OPG's rate request, OPG will be likely be allowed a rate rider to compensate for lower revenues during this interim period. By May that will probably be around $70 million. There's no need for the OEB to resolve the rate application quickly though, as the Premier's promise to control rates means the full costs of their poor pricing decisions and tardy regulating will fall on far distant ratepayers. Consistent with past practice, the OEB believes that it is appropriate to take into account some effect of the application in this RPP forecast. This approach is consistent with one of the objectives of the RPP, which is to smooth changes in prices over time. Therefore, 50% of the impact of OPG’s requested payment amounts, as smoothed by OPG’s updated smoothing proposal, has been used for the purpose of calculating the RPP prices. The inclusion of an amount in the RPP should in no way be taken as predictive of the outcome of the OEB’s proceeding. I don't think anybody could be taking this OEB's actions as predictive of anything - except unpredictability. The Board of Directors of the Independent Electricity System Operator (IESO) has appointed Peter Gregg as its new President and Chief Executive Officer, Tim O’Neill, Chair of the IESO Board, announced today. O’Neill also welcomed three new Directors to the IESO Board: Ersilia Serafini, Chris Henderson and Glenn Rainbird. Good luck to Mr. Gregg, but this looks like simply one more missed opportunity to alter the culture of the IESO. One of the 3 new selections for the board looks wise. I see 1 new SAC'r directly with big wind, another aligned with many in wind, and 2 in the demand response space. Included on the agenda for the next IESO stakeholder meeting is "Market Renewal." The Minister has spoken of technology agnostic procurement, the IESO chatters about capacity markets, and still they pursue demand response separate from other capacity, and technology. I've argued the market renewable plan of the IESO is for it to cease being bad; it is promising $5 billion in savings by improving the intertie relationships it handles, finally moving to the day-ahead market format used elsewhere, and procuring capacity more smartly. The appointments to the SAC don't add credibility to the market renewable promises. A new paper from Russell William Houldin must be very serious because it's paywalled in a journal. "Ontario consumers have paid at least $40 billion (2015) more than was necessary since 2002. Depending on an audit of OEFC and the disposition of the DRC revenues, this figure could approach $50 billion. While not all of these excess costs to consumers were directly the result of the 1999 restructuring, all of the $40 billion rents are built upon the main elements of the restructuring policy: market competition, deregulation, and privatization. Corrective actions to reduce Ontario’s electricity costs follow from this identification of rents. The primary policy requires the abandonment of the idea that Ontario has a market for electricity. Immediate annual savings from the merger of the IESO with HONI, which would assume the role of Central Operator, would be about $250 million." I don't agree with all of Houldin's paper, but liked spotting another suggesting the end of the IESO as a step toward controlling costs. Some of Ontario’s recent policy decisions intended to benefit the environment have become a cautionary tale: neither the environment nor the economy is served by aggressive environmental policies that prove to be economically unsustainable. The energy transition requires good planning and sustained momentum. But the province has yet to revise its policies to reflect this lesson. For instance, it has not repealed the Green Energy Act which set overly expensive rates and led to overly generous long-term electricity contracts. It has suspended, but not cancelled, the second round of its Large Renewable Energy Procurement (LRP II) process, despite forecasts showing that this additional electricity supply will not be needed. The Policy Options column is the opposite, in some ways, of the Houldin paper - concluding with a suggestions such as "provide clear market signals". It doesn't note the signals from the market were clear in 2008. Maybe it's a people problem?